> > Out of that group, AArch64 wins the "simplicity" prize by a mile IMO. Good point. I was considering the v8 ISA in isolation, and ignoring the issue of backwards comparibility to previous versions. How much that matters to the present discussion would appear to depend on how well the older variants must perform in a server-oriented microprocessor. Specifically, can ARM do what Intel did with IA16 in the P6, and hose the performance of the legacy ISA? > > Throw MIPS and Alpha in and there's more of a discussion. > These two are not in the race in high-performance general-purpose space. Nor is ARM at present. I think it would be fair to include MIPS - Their fastest cores are currently in the same class as ARM's, and various people have done pretty aggressive MIPS microarchitectures for network processors etc. Patrick Chase (patrickjchase.delete@this.gmail.com) on February 4, 2013 4:06 pm wrote: > Michael S (already5chosen.delete@this.yahoo.com) on February 4, 2013 2:43 pm wrote: > > Patrick Chase (patrickjchase.delete@this.gmail.com) on February 4, 2013 10:14 am wrote: > > > > > > Out of that group, AArch64 wins the "simplicity" prize by a mile IMO. > > > > After you take into account that, in addition to Arm64, AArch64 cores will have > > to properly execute Thumb2 and, may be, fixed-width ARM32 too, and likely, not > > just user-mode staff, but kernel stuff as well, you may reconsider... > > Good point. 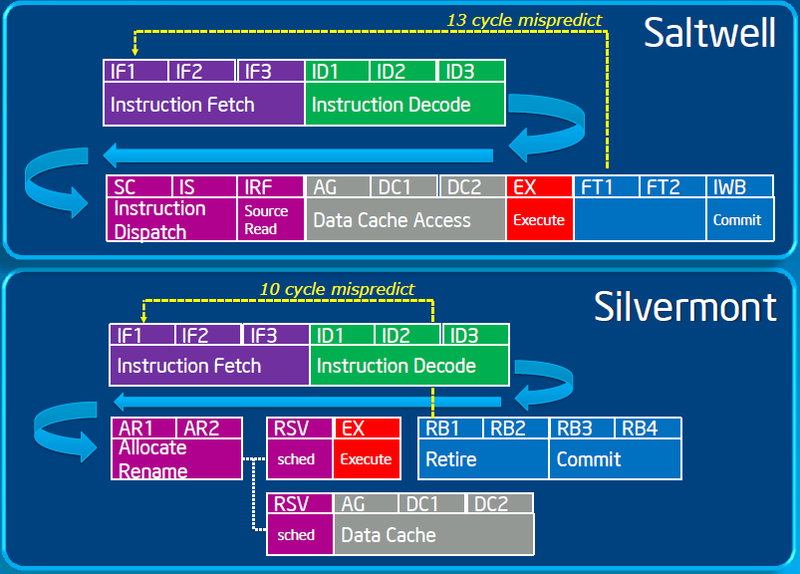 I was considering the v8 ISA in isolation, and ignoring the issue of backwards comparibility > to previous versions. How much that matters to the present discussion would appear to depend on > how well the older variants must perform in a server-oriented microprocessor. Specifically, can > ARM do what Intel did with IA16 in the P6, and hose the performance of the legacy ISA? > > > > Throw MIPS and Alpha in and there's more of a discussion. > > > > These two are not in the race in high-performance general-purpose space. > > Nor is ARM at present. I think it would be fair to include MIPS - Their fastest > cores are currently in the same class as ARM's, and various people have done > pretty aggressive MIPS microarchitectures for network processors etc.